January 22 – Argentinian forward Emiliano Sala was on a plane that went missing over the English Channel on Monday evening while he was en route to Cardiff City after being signed by the Premier League club, French aviation officials have confirmed. The 28-year-old was travelling from Nantes in northern France in a light aircraft when it disappeared from radar 15 miles off the island of Alderney. Sala’s name was on the list of passengers, according to French officials quoted by agencies. Cardiff City said they were “very concerned for the safety” of their record £18 million signing. The plane was flying at 5,000 feet, police said. But on passing Guernsey it requested descent, and air traffic control lost contact while it was flying at 2,300 feet. A team of lifeboats and helicopters from Guernsey and the UK, and a helicopter from Cherbourg in France, embarked on a search and rescue operation. 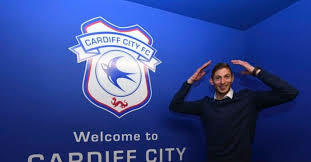 Sala had first flown to Cardiff on Friday morning to undergo a medical and later posed for a picture holding a Cardiff City shirt. He then returned to Nantes to sort out his personal affairs. Sala has been among the top scorers in France in recent years and had scored 13 league and cup goals this season, third behind Kylian Mbappe and Nicolas Pepe.